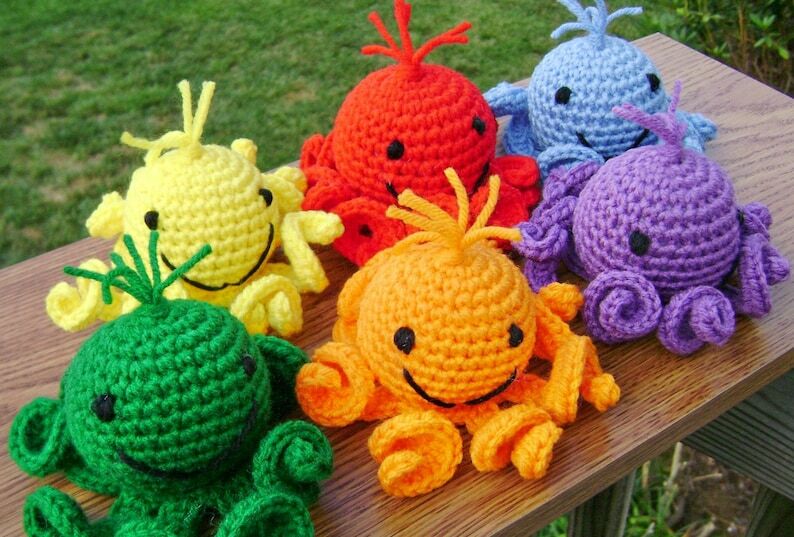 Here is a rainbow of crocheted, stuffed Amigurumi octopi toys for you to choose from – red, green, blue, purple, yellow and orange. These octopi are crocheted using soft acrylic yarn, and stuffed with polyester fiberfill. Their eyes and smiles are embroidered with yarn. The octopi vary slightly in size based upon the yarn used, but they are around 2 3/4 inches (7 cm) tall. This listing is for ONE octopus. Choose your color from the drop list at the time of purchase. If you are making your purchase using an app that doesn't support the dropdown choices (such as a smartphone), please contact me with your color choice. Or, I can create one in any other color you want (assuming I have yarn in that color). Just please convo prior to purchasing so I can verify if I have color you are looking for. The pictures are representative of the octopus you will receive, however each one is created as needed. Your octopus will typically be shipped 3 to 5 days after purchase unless I already have one made up in your color choice. I will let you know when it ships. Created in a smoke free, pet friendly home, from a pattern from Sue of HappyWhosits. Care instructions: octopi may be machine washed on gentle cycle, in a hosiery bag or pillowcase, and then air dried, or put in the dryer on low temperature. Shipping: Your octopus will be shipped via USPS First Class Mail with Delivery Confirmation within the United States, Outside of the US, including Canada, USPS International First Class Mail will be used (sorry, no delivery confirmation available). International customers are responsible for any duty or customs charges set by their government. Thanks for shopping at Dffodil Corner!